The TJ Maxx Credit Card: A Good Fit for Fashionistas? TJ Maxx has branded itself as the place to buy designer duds for less. So if you’re already in one of its stores looking for affordable Steve Madden boots or a less pricey Ralph Lauren bag, there’s a good chance you’ll be tempted to pounce on an extra 10% off at the register. That’s the bonus you’ll get for opening a TJ Maxx credit card. Of course, the opportunity to score a discount doesn’t mean you should necessarily open an account. First, you’ll want to consider how much of a Maxxinista you really are. And if you decide you’re scouring TJ Maxx and/or its sister chains Marshalls, HomeGoods and Sierra Trading Post frequently enough, you’ll have to choose which of its credit cards — the TJX Rewards Credit Card or TJX Rewards Platinum MasterCard, both issued by Synchrony Bank — is right for you. In this TJ Maxx credit card review, we’ll help you tackle both of these issues. Rewards Details: In addition to that 10% off your first purchase, cardholders get 5 points for every dollar spent at TJMaxx, Marshalls, HomeGoods and Sierra Trading Post stores. You’ll earn a $10 rewards certificate for every $200 spent at their family of stores. Rewards Details: You get the same 10% discount on your first purchase and 5 per points per dollar, similar to the TJX Rewards Credit Card. You can use this card anywhere MasterCard is accepted, and you’ll get one point on each dollar spent outside TJ Maxx, Marshalls, HomeGoods and Sierra Trading Post stores. Should I Get a TJ Maxx Credit Card? The 5% cash back on in-store purchases is certainly competitive as far as store credit cards go and could be worthwhile if you shop often at TJ Maxx stores. But, as you may have noticed, the variable APR on both cards (28.99%) is, well, pretty darn high. High APRs are commonplace when it comes to store credit cards, but they essentially mean that if you’re prone to carrying a balance — or fear the allure of rewards will lead you to overspend — then you’re probably better off passing up the offer. 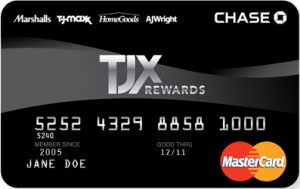 Here’s the other thing about TJ Maxx credit cards: Whether we’re talking the standard or the Platinum, your rewards can only be redeemed at TJX stores. That may feel like less of a drawback compared to other store credit cards, given the popularity of TJ Maxx, Marshalls and HomeGoods. But you’ve still got some redemption hoops to jump through. First, you’ll have to accumulate 1,000 points before you can use any of them in the form of a rewards certificate. (Those certificates are issued in $10 or $20 denominations.) Points don’t expire, but certificates do two years after the issue date, and points can’t be redeemed toward TJX-brand gift cards, gift certificates, e-gift cards, any third-party cards, cash or payment on your credit card account. Again, the card could still be worth considering if you’re a loyal shopper and you pay your balances off in full all the time. However, if your shopping habits are more fickle and you’re looking for some more flexibility when it comes to redeeming your rewards, here is another card to consider. Why We’re Mentioning It: The standard Chase Freedom card comes with revolving quarterly categories you have to enroll in. But its Freedom Unlimited (see full review here) may appeal to people who are looking for something even more low maintenance. The card offers 3% cash back on all purchases in your first year up to $20,000 spent. After that earn unlimited 1.5% cash back on all purchases. Cash back can be redeemed at any time, in any amount. At publishing time, Chase Freedom and Chase Freedom Unlimited are offered through Credit.com product pages, and Credit.com is compensated if our users apply and ultimately sign up for these cards. However, these relationships do not result in any preferential editorial treatment.